LA DEVIATION NE DEVIE PLUS ! 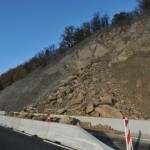 The road was closed following a landslide on RD 840 on exiting Viviez. Several detours are being organized in order to carry out reinforcement works. Extensive road work that should take two months to complete. The whole thing is rather "a mess" as the popular saying goes. 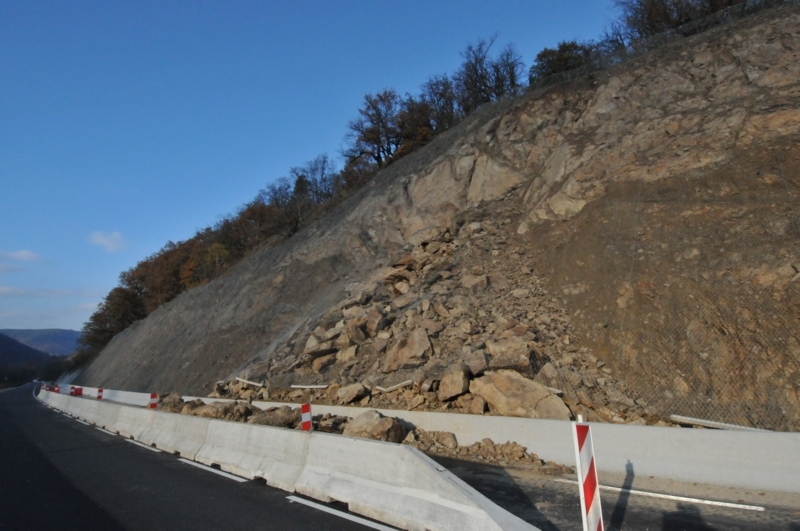 According to technicians the fallen rocks-turned-landslide , which originally occurred on November 15th on the RD 840 detour to Viviez, just outside the 'city of zinc' towards Figeac (read our report dated November 17th), has just goten worse. There was an episode late on Tuesday which prompted the conseil Général to act wisely and close the road to traffic as early as Tuesday at 8 p.m., although since November 15th traffic has only been one-way, with alernating traffic lights. A 300 m3 ballpark figure of the amount of rock that came off the rocky wall is being tossed, whearas the day after the first rock fall it was estimated to be 80 m3. According to the two land surveyors working with Sépia who went to the site and stood by the highest authorities of the Conseil Général Road Work and Traffic Control Services, the phenomenon is all the more likely to be repeated in days and weeks to come than "the decompression that recently occurred has caused large splits at the back…"
The land surveyors were forced to admit that their science is not an exact science, being extremely difficult to establish a comprehensive diagnosis when drilling cannot be carried out due to steep inclines and "one must rely on visual data only…"
Consequently road users will have to be patient and use detours since the work is expected to last until "the last fortnight in January", although the Conseil Général has promised to "do its utmost" to partially restore traffic during the end-of-year festivities. Traffic wil be realigned from Rodez via Rignac and Villefranche to Figeac, while a local detour will run through Aubin, Monbazens and Capdenac. It i also possible to take the Livinhac bridge and head for Penchot to meet the usual route. In a previous article we mentioned the treatments under consideration: netting or a nailed wall. Yesterday those working with Road Work and Traffic Control Services laid out the figures. The first option would cost 13 € / m2, the second 220 € / m2. Given that a single-stretch, 170-km portion of road represents 2040 m2, it is easier to understand the stakes.